Tenants for the end zone expansion include Women's Basketball, Men's Basketball, Athletic Director's Office, Longhorn Foundation, Business Office, Trademark and Licensing, IAW Events, IAM Events, Marketing, Sports Information, and General support spaces. Profile: As Texas football moves into the 21st century, Darrell K. Royal-Texas Memorial Stadium continues to evolve as a state-of-the-art facility and remain at the forefront of college football. The latest expansion calls for upgrades at the south end zone seating, which increases the stadium's capacity to 100,119, making it one of the largest in the nation. From the $150 million budgeted for the expansion, more than eight million dollars were spent on audiovisual improvements including the "Godzillatron," a 7370 SF high definition LED scoreboard, one of the largest high-definition screens in the Western Hemisphere. 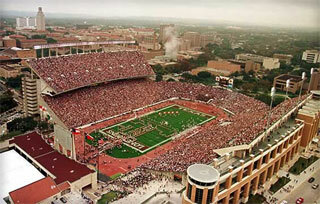 Players and fans of the stadium enjoy extensive technology capabilities, unsurpassed in collegiate sports. Services: DataCom Design Group has provided low voltage services to The University of Texas for several upgrade projects at the stadium. Services have included IT infrastructure, AV infrastructure, security, and outside plant connectivity (OSP).